Friday morning, Morning Prayer and Mass (St John of the Cross, commemoration of the Feria). I had intended on getting my funeral homily for Saturday and Sunday’s homily done, but in the words of Forrest Gump, we had lots of visitors. The office is closed on Fridays but somehow it always seems to be one of the busiest days. Members of the family came by to prepare for the funeral reception, a parishioner stopped by with some medical news, and a man came by looking for assistance with gas. As policy, we don’t keep cash on hand, so I went with him to a gas station and bought him a gas card. When people come in looking for financial assistance, sure, it’s a crap shoot. Sometimes they are scheming and want money for things other than household necessities. Sometimes people will ask for gas cards or food cards and then sell them for things other than household necessities. Sometimes you can tell quickly whether someone’s story is legit and sometimes it is impossible. In every case, the person standing before you is in need. I tend to err on the side of help. I believed the gentlemen and I hope he continues on the path he says he’s on. In that moment, it wasn’t for me to judge the trajectory of his life. He simply asked for gas. If he doesn’t use it that card for fuel in his car, that’s on him. If I don’t help him, that’s on me. Saturday was full. Christmas Pageant practice in the morning and a funeral at 1pm. I had a vestry social that evening so I couldn’t stay for the funeral reception. Half of the family is from Sierra Leone and this family always, always has the best receptions. I did pause long enough to have, what I call, a Sierra Leone hushpuppy. Instead of cornmeal and sugar, it has rice and other wonderful things. The evening was spent with the vestry at our Advent social and then my son’s basketball game at 8pm (sinful to have a game so late). 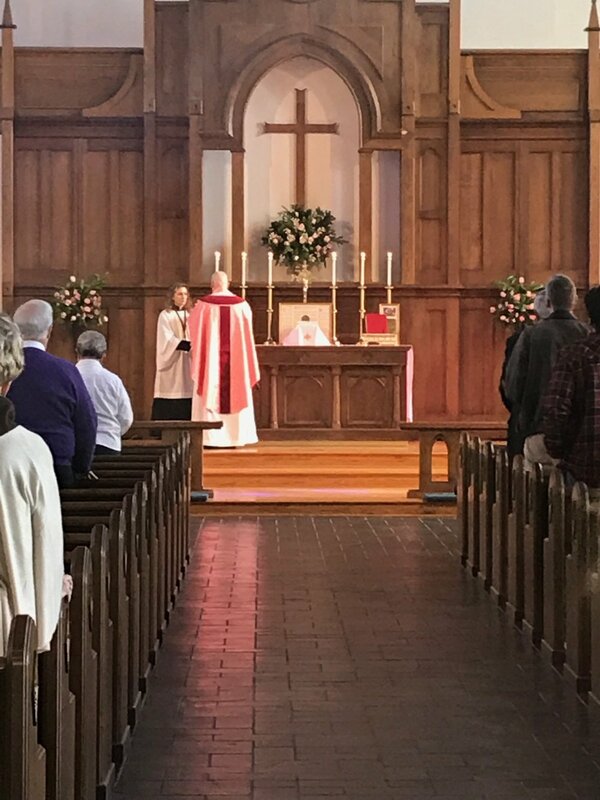 Sunday was Gaudete Sunday and the congregation was resplendent in rose. I preached on Luke’s Gospel and the human tendency to act as if our sins aren’t actualized unless they are discovered, a false assumption. I also confessed my failure in having more opportunities for people to make their confession, something I vowed to remedy. After mass, I had a vestry meeting, and then after the meeting – The Greatest Christmas Pageant Ever. I do hope you will look at this pictures. It was sound theologically and beautiful. It wasn’t a spectacle of children put in positions to look cute. It was a re-telling of the story of Christ’s birth and what that means for us. It had solemnity and wasn’t a spectacle. I am very proud of the children and youth. A whirlwind to be sure. And in this one, God was to be found.